Rob's Toys and Treasures has changed its name to R&L Gemsentials. I am the past president of the Monashee Arts Council (still a director) and currant president of the Vernon Lapidary Club. My artistic endeavors include rebuilding old toys and creating hand made jewelry and doing a bit of lapidary work. I have been at this now steadily for about 6 years and enjoy creating new ways to display the gemstones we use. I was also one of the founding members of The Gallery in Lumby, some of our work will be found there, check out the other great art work there. These earrings were made for Valentines day and Easter or even Mothers day. 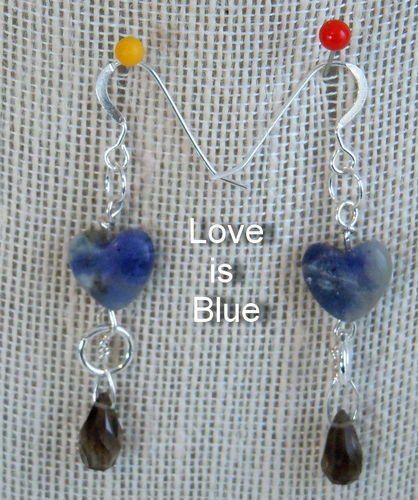 They are made with Sterling Silver wire and heart shaped sodalite beads and smokey quartz beads. This wire wrapped pendant is sterling silver and auralite. Auralite comes from a mine in Ontario and consists of up to 23 separated minerals, the most obvious of which is amethyst.